Unfortunately I have only learnt of Frank's death in late 2014. I am saddened at another passing of the old timers, but he lived a full life of 90 years. Here is an: obituary in Meanjin. 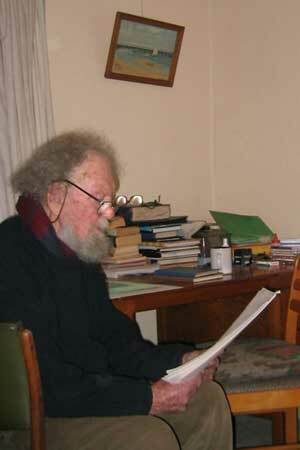 Frank Kellaway reading one of his poems at his city desk, June 2006. Frank Kellaway (19 April, 1922 - 12 July, 2012) was a poet. He also wrote novels, children's literature, a libretto for George Dreyfus. He was also a painter. He moved in wide circles throughout his life; the names of his friends and acquaintances recall an era of Australian intellectual and artistic life: Manning Clark, A.D. Hope, Gwen Harwood, Russell Ward, Arthur Boyd, Geoffrey Dutton, Maria Lewitt, Dinny O'Hearn, David Armstrong, Dale Hickey, Bary Dowling, Evan Jones and Peter Mathers. This interview © Copyright Frank Kellaway & Craig Robertson, 2006. Music in this podcast includes extracts from Mendelsohn's Song without Words, played by Ronald Farren-Price, from his album "Reflections", courtesy of Move Records © 1993. In my study: notes on secondhand bookshops; see In my study No.5 (4.6 Mb; 5' 01"). A whaler, Frank Kellaway, illustrated by Patricia Thomas, Oxford University Press, Melbourne, 1967. Garni Sands: opera in two acts, by George Dreyfus, libretto by Frank Kellaway, vocal score by Willy Giefer, Allans Music (Australia), Melbourne, 1972. A Straight Furrow, Frank Kellaway, Cassell, London, 1972. Beanstalk: poems, Frank Kellaway, illustrated by Joe de Lutis, Contempa Publications, Melbourne, 1973. Golden Dan, Frank Kellaway, Macmillan, Melbourne, 1976. Bill's Break, writing as Alistair Skelton, Champion Books, Melbourne, 1983. Note: The Study podcast interviews are generally tightly edited versions of the originals, which are much too long for a one hour format. In producing this program with Frank Kellaway I have not edited his poetry readings, as I think his diction and rhythm are excellent and don't need my interference; the poems are presented as read.